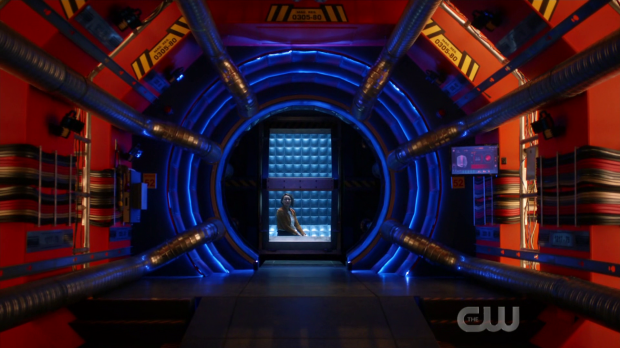 The Flash focuses on the threat Cicada 2.0 represents and secrets continue to cause problems for the team. The introduction of the adult Grace as a new Cicada last week was really effective in terms of how it was executed. She immediately came across as a formidable threat to Team Flash even if the prospect of continuing the Cicada plot is less than enticing considering how tiresome it has become. Grace’s immediate mission is to avenge the death of her parents by killing the Metahuman responsible. She bore witness to her parents death and has been consumed by it ever since which sort of makes her a bit of a dark Batman at least in terms of the similar circumstances of their origin stories. It’s interesting to see the defining moment act as an inspiration for villainy and helps Grace be a bit more relatable as a character. One thing Grace is initially lacking around this event in her life is proper context. The death of her parents was an accident due to the Metahuman Vickie (Catherine Lough Haggquist) not being able to control her powers. In some ways Vickie is as much a victim as Grace is as she has to live with the knowledge that circumstances beyond her control caused harm to others. She chose not to tell the family that she’s a Metahuman and lived her life in secrecy since the day of the accident. Vickie may be a one shot character with a specific purpose but Catherine Lough Haggquist manages to make her sympathetic in a very short time. Barry uses the Vickie example as an opportunity to highlight the dangers of keeping secrets to Nora which ties into her specific emotional journey this season. 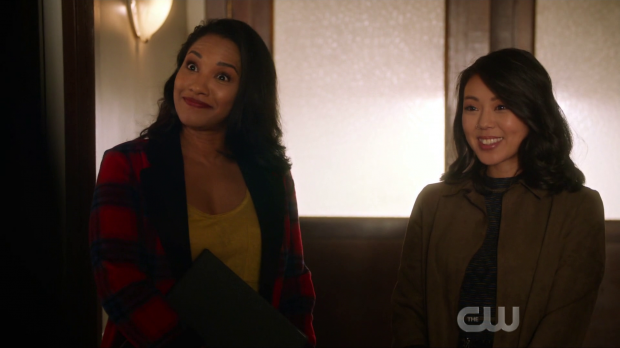 It’s a good lesson and has certainly been -hopefully- well learned by every member of Team Flash by now but would have held more weight had Barry told her how keeping secrets negatively impacted them as a team. This is largely designed to intensify Nora’s guilt by using an example of a worst case scenario and it works well. I’ll come back to the other examples of secrecy in this episode later in the review. Grace remains unsympathetic to her parent’s death being an accident as she’s unable to see past the fact that a Metahuman killed her parents. This one event is the basis of her hatred that has been cultivated over her entire life and completely warped her mind into something twisted. Orlin of all people tries to be the voice of reason by pointing out that the death of her parents looks like an accident and she is focusing her energies on someone who had no ill intent towards her or anyone else. This makes Grace feel isolated as it appears to be a betrayal of everything that Orlin is supposed to stand for. It’s a confirmation that Grace’s obsession has driven her insane and that the facts no longer matter to her. The existence of the 10 year old version of her in this time period opens up many possibilities in resolving this story. It’s possible to do something that could prevent her from becoming the version of her that has travelled back in time such as appeal to her better nature in some way or give her the cure so that she can never use her powers again. That solution seems unlikely at this point as she’s unable to give informed consent but what if the future version of Grace makes that decision for her after coming to some sort of profound realisation? She could end up curing herself so that she has a better life which would be an interesting interpretation of consent and would open up a discussion about whether a future version of a person counts as that person. There are certainly ways to prevent her developing into Cicada 2.0 including killing her when she’s in a coma which would make for an admittedly savage solution. This episode removes the possibility of Orlin being the one to help her change. It seemed as if he was starting to see the error of his ways after being treated with kindness by Barry and the rest of Team Flash which gave him a tangible example of Metahumans not being inherently evil. It would come across as a really quick backpedal on his previous mindset but it makes a certain kind of sense and tracks with what the writers have done before with other characters so it appeared to be the direction this was going. Grace sees his change of heart as a betrayal of what he’s supposed to be and kills him with his own dagger before vowing to kill all Metahumans before they become as abundant as they are in her own time. Having her kill her uncle shows an abandoning of her humanity and possibly might make her responsible for her own creation. Secrecy is something that permeates this episode in different ways. It makes sense as a recurring theme as Nora is trying to find the courage to come clean about her association with Thawne so the episode takes steps to explore the impact of secrets on other characters. I’ve already talked about the Vickie example which ends up complimenting Cisco’s developing relationship with Kamilla. Vickie kept her powers a secret from her family out of a desire to protect them which means that there’s a big part of herself that she hides from them. 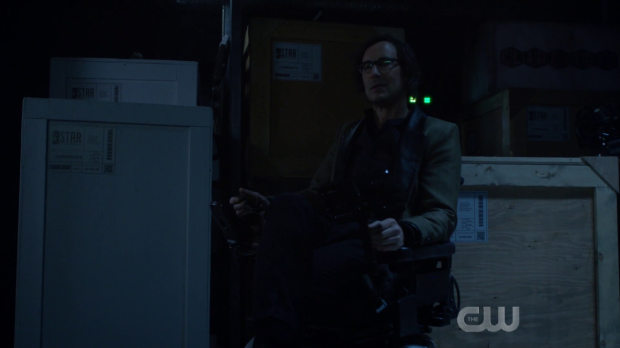 Cisco is doing the same thing because he likes the idea of Kamilla being unaware of the life he leads at S.T.A.R. Labs with Team Flash. It ties into his desire for a normal life that has been running in the background all season and shows that Cisco is approaching a crossroads in terms of decisions that he has to make. Ralph rightly points out that there’s no way he can keep her out of this part of his life forever because Team Flash takes up so much of his time and it will likely end up causing friction within their relationship. No matter what reason he gives he’s still being dishonest with her and that isn’t the best basis for a relationship so Cisco has a lot to consider. As interesting as this is it’s robbed of some of its impact as we haven’t seen the growth of this relationship play out. Kamilla has appeared twice; once when they met and a second time for their first date that took place in a time look so the development towards being “social media official” hasn’t been depicted at all which makes this relationship impossible to invest in as there is no relationship. This is the episode where Nora’s secret is revealed to the team and it’s something she wrestles with throughout the episode. Thawne tells her that the only option is for her to be honest with the team as to her involvement with him as events have spiralled outwith his control so extra help is needed. It takes her so long to decide to go through with telling the truth as she internally tries to justify keeping secrets if the intentions are noble enough. Eventually it gets to the point where she’s ready to tell the truth but Sherloque beats her to it after pulling all of his information together to reach the conclusion that she’s working for Eobard Thawne. It’s pretty much the worst possible way for the secret to come out short of Eobard Thawne himself turning up to break the news. The fact that it doesn’t come from Nora makes the reaction to it all the more passionate as it appears that she had to be forced into telling the truth. Sherloque is also merciless when it comes to throwing Nora under the bus and seems to leap to conclusions about the intent behind her duplicity. The shock of the betrayal intensifies this and Nora has absolutely no support in this moment. Grant Gustin’s performance when locking her in the pipeline is brilliant. He really sells the anger and pain felt as a result of finding out that he was being lied to for months on end while opening himself up to the daughter that he would one day have. Nora breaking down when she realises the impact her lies have on Barry is equally powerful and sets up a strong emotional tension for the coming episodes. A strong episode that offers an impressive introduction to Cicada 2.0 and explores the consequences of secrecy in nicely varied ways. 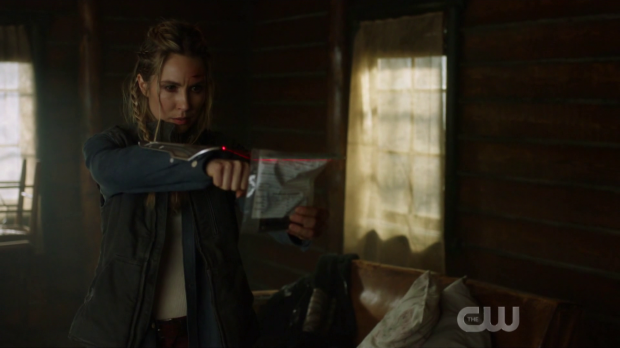 The introduction of an adult Grace taking on the role of Cicada in the previous episode was impressive enough as a spectacle and this episode picks up the momentum nicely by establishing her simple yet effective motivations and clearly showing that insanity has consumed her while strongly hinting at the cause of that. Her obsession with avenging her parents acts as a dark mirror to a superhero origin story and her inability to listen to facts shows how far gone she is. The subversion of the expectation that Orlin would end up talking her down after realising the error of his own ways works well and Orlin’s change of heart after being shown kindness by Metahumans makes sense even if it’s a little rushed. His death at her hand -or knife- shows that she is abandoning her humanity and may be responsible for her own creation. It’s very possible that her connection to her 10 year old self will end up being the solution here whether she decides to cure herself so that she has a better life or puts an end to her younger self in some way. Vickie may be a one shot character but she’s a very good one with a clear purpose within the narrative and comes across as very sympathetic. Her connection the the theme of secrecy and the consequences of it mirrors Cisco’s approach to his relationship with Kamilla. Both keep a significant part of their life separate from their relationship and both fail to realise that the two worlds can’t be apart forever. For Cisco this links into the desire for a normal life he has been dealing with all season and further sets up the crossroads he is coming to in terms of deciding what direction to take his life. Nora wrestles with Thawne’s instruction to tell Barry everything about their connection as it’s the only way to take action now that the timeline has changed significantly. The truth ends up coming out via Sherloque which makes the situation so much worse and the reaction all the more passionate. Grant Gustin plays Barry’s angry and hurt reaction perfectly and this is punctuated nicely by Nora breaking down when she feels the weight of the loss of trust. It’s a powerful moment that sets up the next stage in the conflict wonderfully.